There are about 8.7 million species of animals on Earth, each different from the other in some of the other way. The animal kingdom has always surprised humans with their distinct features. Well, in case of Fluffy, the three-headed dog in ‘Harry Potter and the Philosopher’s Stone’ gave you a panic attack, then let me tell you that the list did not end there. Many more weird looking animals live on our Earth, peculiar enough to give a nerve chilling feeling. Here are top 10 weirdest looking animals from different parts of the world. If Armadillos’ appearance frightens you then there is something worse than that too. The scaly appearing Pangolins are one of the weirdest looking animals. These primarily nocturnal creatures are covered from head to toe with scales made up of Keratin. This rigid appearance also acts as armour for them. With a sticky tongue which is longer than its body, small conical head and jaw lacking teeth; Pangolins often look scary. Their scales constitute 20% of its weight. They feed on ants and termites. There are 8 different species of this mammal. But unfortunately they fall under the category of endangered species, mostly trafficked for their meat and scales. Naked mole rats are one of their kind. Scary and weird yet unique. These wrinkled rodents live in harsh conditions but that does not affect them. Rather they live eight times longer than other rats. The Tyrannical Naked Mole Mommy is called the queen as it is the only breeding female who intends to have identical twins. These creatures almost never become a prey of cancer. Also, the newborns have well-developed brains, indeed making them better than the rest. The average litter size is 28. Dumbo Octopus is not actually dumb. This semi-transparent octopus is often difficult to spot since it resides just slightly above the seafloor. It is therefore known as the deepest living octopus. Dumbos have one single row of suckers on each arm, but they don’t have ink sacks. They grow up to 8 inches. What makes them look weird is their ear-like fins. If you have been drooling over the cuteness and innocence of piglets and pigs, then you need to know something about other members of their family. Babirusas are wild pigs, weighing up to 100 kg. These are unique, with multi-chambered stomach and deer like limbs. Hence their name which means “Pig-deer” in the Malay language. These are omnivores in nature. What places them among the weirdest looking animals is their tusk. The four species of Babirusa (males) have long upper and lower canine teeth. The most surprising part is the growth of the upper canines. They grow throughout their lifespan. As they grow, they often rotate and pierce their skull too. Also, read about amazing blind animals. Lamprey, the jawless fish is both weird looking and terrifying. Not all of them live in the sea; some remain in fresh water throughout their life. Their mouth acts as a suction cup with the piercing teeth that hold the prey. Lamprey lacks bones and has seven-gill openings on each side. They regenerate, just like Spiders, Starfish, and Lizards. They have a strange mating system, as they die just after spawning as they don’t eat for a long period to make space in their digestive system. Ever imagined a fish to weight as much as a car? Well, Ocean Sunfish is the heaviest known bony fish in the world. This circled shaped aquatic animal lacks a swim bladder and tail. But surprisingly, it can still dive deep into the sea. They have extremely weird teeth. Sunfish lay somewhere near 300 million eggs at once. The older the females get, the more eggs they produce. You can also read about bioluminescent animals on planet Earth. A member of the rodent family, Gobi Jerboa is known for surviving in the extremely hot desert and their long big ears help them to remain cool. But apart from every other fascinating characteristic, their Kangaroo like legs make them look weird. Jerboa can even jump up to the height of 9.8 feet. They have a tail that sometimes exceeds the length of their body. Jerboas are nocturnal animals and have sharp hearing power. An interesting fact is that Jerboa was Britain’s WWII mascot. This mammal in the forests of Madagascar is as long as 6 feet; its tail being as long as its body. Fossas are quite unique when it comes to their growth, behaviour and mating. Their appearance reflects that of a cat, a dog, and even a mongoose. The fossa is an omnivore and solitary animal. Their scene glands have a major role in their survival. The most unusual characteristic is female Fossas being temporarily masculine. They hunt in both day and night. These are not at all like other monkeys. 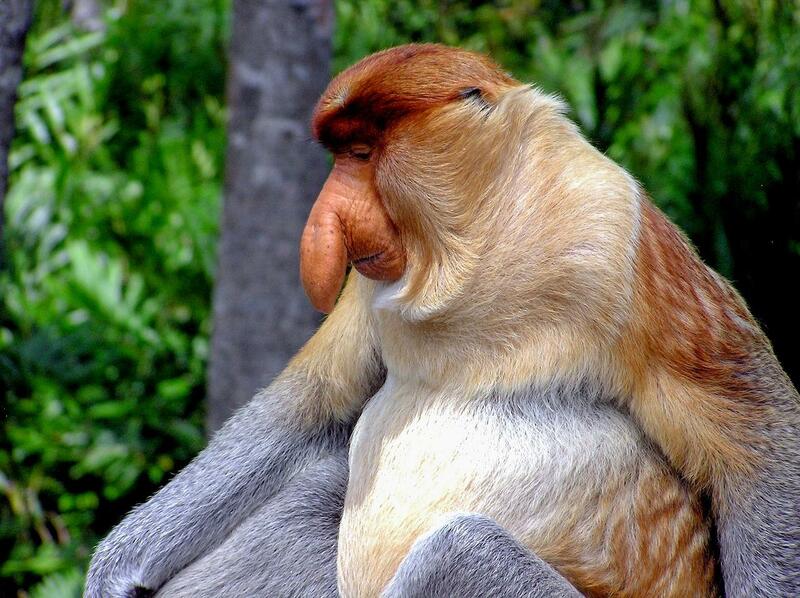 Native to the island of Borneo, Proboscis Monkeys truly define their name (Proboscis means long-nosed). These are reddish brown mammals. Males have a weird nose that hangs till their mouth. Though females also have a nose it is not as big as their counterpart. Another thing to notice is their pot belly that comprises multiple chambers. Their partially webbed feet make them an excellent swimmer. These are social by nature and are always found in groups. It is one of the ugliest animals in the world. Fawns are one of the cutest baby animals and so are Deers. But Tufted Deer is nowhere close to your imagination of Deer. The vampire-like canines in makes give them a weird appearance. It grows up to 2.6 cm long. These small and shy deers are not often seen in pairs. They earn their name from their appearance, especially the tuft of dark hair on its forehead. Unlike other deers, Tuft deers don’t fight with antlers, rather they use their fangs. When frightened or angry, they bark. Isn’t it interesting?